Place the egg roll wrappers on a flat, dry surface with one corner of each pointing toward you (i.e., as a diamond, not a square). Distribute the chicken, tomatoes, bacon, and cheese on the wrappers in a row that is 1 1/2 to 2 inches wide and 5 inches long. Make sure that the filling is never less than 1 inch from the edge of the wrapper. 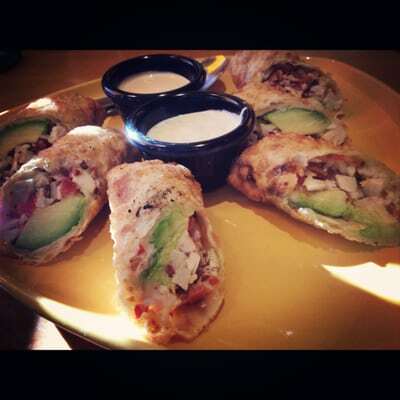 Divide the avocado slices among the egg rolls, placing them on top of the cheese with the longer (skin) side toward you. Stir the eggs in a small bowl to lightly liquefy. Add 2 tablespoons of cold water and beat with a fork until evenly mixed. Working with one egg roll at a time, lightly brush egg wash over 1/2 inch of each side of the wrapper. Fold the corner closest to you over the filling, pressing down and pulling tight toward the center. Press the left and right corners down to seal the edge. Lightly coat the 2 bottom corners with egg wash, then fold right and left corners inwards over the filling, pressing down to seal the edge. Add additional egg wash to the top corner creases and press down to seal. Continue rolling into a compact roll, pressing lightly to seal all edges. Line a 9 x 13 inch baking dish with waxed or parchment paper. Sift half the cornstarch over the paper, and place the finished egg rolls in the dish, making sure they do not touch one another. If you’re going to fry the egg rolls later, sift the remaining cornstarch over the egg rolls, cover with plastic wrap, and refrigerate for up to 24 hours. Heat the oil to 375 degrees in a deep 10 inch skillet. Fry the egg rolls, making sure that they are not touching (you may have to do this in 2 batches), for about 1 1/2 minutes. Turn with tongs, and fry for another 1 to 1 1/2 minutes, or until the egg rolls are golden brown all over. Remove with tongs and drain completely on paper towels. Cut each egg roll in half diagonally and garnish each pair with a sprig of parsley. Make Ranchito Sauce by whisking 1/2 cup of ranch dressing with the mayonnaise and hot sauce. Serve the egg rolls with the Ranchito Sauce in one bowl and the remaining 3/4 cup ranch dressing in another bowl on the side for dipping. When you say make the ranch into sauce by taking 1/2 cup of ranch dressing with mayonnaise but above in the recipe it calls for 1/4 cup could you let me know which it would be? If I am frying the egg rolls immediately do I just omit 1 tbsp of cornstarch? I do want to say these are one of my favorite things!!!! How do you season the grilled chicken breast?